In this chapter we are going to chronologically connect humanity to the time of the rest of the Muniverse by first linking and syncing our current Gregorian Calendar with a Divine Calendar, by following the chronological leads hidden within the pages of the Bible. We call this Divine Calendar Jojakin, which will turn out to be the King of all calendars, but which stealthily ran in the background all along since the rebirth of Adam and will mouth out into the Great Jubilee in the year R2210, together with all other calendars. The world currently uses the Gregorian Calendar, which is an adaptation of the Julian Calendar. These are both determinate versions of the observational Roman Calendar. These determinate calendars are ruled by numbers, where the March equinox moves constantly backwards on the Julian calendar and flutters around between 19th and 21st of March on the Gregorian Calendar. The Roman Calendar is observational, where the March Equinox is kept steadily between the hours 00H00:00 and 23H59:59 on the day of March 20. One can understand the reasons for determinate calendars in the age of bad communications, but the 6th Generation will revert to observational calendars, because Science is now able to correctly predict (observe) the equinox as well as the synodic month for thousands of years ahead. We work here with the Roman Calendar which will become a mere control calendar after the year 2022, when all religions of the 6th Generation will be guided by their calendars, while secular humanity will be born, grow up, be schooled, work, play and die on a specially adapted Secular Calendar. We will discuss the switch-over from the Gregorian to this Post Exile Calendar in a later chapter. ​WILL THE REAL JOJAKIN PLEASE RISE? Many religious people, including the Jews, think that one can simply add up the ages of the fathers in the genealogical lines of Gen.5 and 11 plus some other dates given in the Bible to effectively determine the years between Adam and now, but that is hopelessly inadequate, in fact totally naïve! The people known as creationists even take this gullibility a step further by adding 6 normal human days to determine the age of the complete universe! What utter nonsense! The fact of the matter is that there is a divine calendar hidden within the pages of the Bible, just waiting for the right moment to be revealed. The reason for this is quite simple. Humans on earth are part of an intricate life system that is spread throughout the universe. In the universe life and time is irrevocably interwoven and the time has come for humans on earth to be made aware of this fact. So, God, in the Person of Archangel Michael, wrote a special Calendar that is in perfect synch with the universe, hid it within the text of the Bible and present it to humanity via His Image and end-time Prophet. A form of H3078; Jojakin, an Israelite king: - Jehoiachin. From H3068 and H3559; Jehovah will establish; Jehojakin, a Jewish king: - Jehoiachin. Compare H3112. A primitive root; properly to be erect (that is, stand perpendicular); hence (causatively) to set up, in a great variety of applications, whether literal (establish, fix, prepare, apply), or figurative (appoint, render sure, proper or prosperous): - certain (-ty), confirm, direct, faithfulness, fashion, fasten, firm, be fitted, be fixed, frame, be meet, ordain, order, perfect, (make) preparation, prepare (self), provide, make provision, (be, make) ready, right, set (aright, fast, forth), be stable, (e-) stablish, stand, tarry, X very deed. Here the translators make an unforced blunder and aptly demonstrate their inclination to interpret certain things in the Bible they don’t understand, instead of simply translating. The word ‘Jojakin’ is used only once in the Bible, but because the name is derived from the same Hebrew root (H3559, which means ‘to set up’ or in fact ‘to erect’) as the name of Jehoiachin, they did not give it any more thought, but just inserted the name Jehoiachin in the place of Jojakin and allowed themselves to be led totally astray. ​The last bit of persuasion surely must have been the fact that Jojakin is also referred to as a King, which they interpret as a king of Judah, so in their minds, Jehoiachin it surely was, but wrong they surely are! So, let us get into the business end of “erecting” this calendar by using the tips the Archangel left in the Bible to enable us to “set up” Jojakin with the building blocks He supplied. In Gen.5 one finds a genealogical register which is continued in chapter 11. This register gives us the years spanning the time from Adam to the birth of the patriarch Abraham. At the very first glance you see that this chronology differs a lot from the one given in the Bible, but before discarding it completely you think about the fact that Josephus was a very trusted historian. He could go a little overboard with a wealth of words, but he surely tried to write down history as accurately as was possible. Then you ponder about this chronology and conclude that Josephus must have accessed documents in the ancient Temple archives, which are unavailable to us. And then, inspired by the Spirit, comes the answer of how to use both the chronologies given in the Bible and Josephus in order to correctly conclude the chronology of the Bible. Below is a table with the different set of chronologies, but now I must first give an explanation of how I adapted these figures to bring them on the same level: The two different ways of writing down the ages can be very confusing, I suppose for both the authors as well as the expositor. ​That’s why I have adapted all the years to reflect the ages. This means that when it is written i.e. that Adam was in his 230th year (Josephus), I would write down his age as 229. However, in this specific case I must take the Bible’s figure of Adam already being 130 years old when he ‘begot’ Seth. Josephus’ figure is then revised accordingly to be 230. Josephus says that Arphaxad was born 12 years after the Flood. On the side of the Bible I put down a 1 (as a correcting element) because of an obvious mistake in Gen.11:10 where the age of Shem is given as 100, 2 years after the Flood. You will also notice that the fact that Arphaxad was born 2 years after the Flood can be discarded, because on that side of the Table only the succession years of the prophets count. The age of Terah I left just like that with the difference between Josephus and the Bible (120 and 29), not like the other ages which differ with exactly 100 years. Jacob and Joseph: Jacob was 130 years old with his entry into Egypt (Gen.47:9) Joseph was 30 when he started in Pharaoh’s service (Gen.41:46). Then there were 7 years of abundance. After 1 year of famine he sent for his father. That mean Jacob was 92 when Joseph was born, and Joseph was 38 years old at the time of Israel’s Entry into Egypt. I will draw up a table now, giving the timeline of the chronological prophets of the Bible. Do not read me wrong. There are many more genuine prophets beside this timeline, both inside and outside the Bible. The names here are expressly given to draw up this basic timeline which will serve as a benchmark for all chronologies and all different calendars of this Aion. It doesn’t matter if the calendar is Hindu or Buddhist or Islam or Science, Christian, Judaic, Tropical, Lunar, Luni-tropical or whatever, the years and names given here must serve as chronological markers against which ALL calendars will be authenticated. The calendar isn’t divine for nothing. This information (like so many others) is encoded prophetically in the Bible and only a very special and divinely inspired prophet will be able to decipher the information. And one more thing: To the sceptics out there who would think that these Patriarchs were very old when they produced their offspring, relax! The ‘children’ mentioned in the succession do not have to be a direct child, but somebody a few generations down the family line, a great-great-grandson or even ‘greater’! Like Seth in the chronological prophetic succession was born in the 12th generation and certainly not the direct third son of Adam and Eve. Proceed with the timeline as follows (see table at the end): Fill in all the chronological prophetic names consecutively in descending order in the 7th column (Prophet 1). Then write down the succession years in the 6th column (+). As we go along I will disclose whether to use the information from Josephus or the Bible for this column. Then proceed to accumulate the figures and write them down in the 5th column (Jojakin). This column will thus give us the years after Adam. Leave the 4th column open for the time being, because this column is reserved for the Roman calendar, the Gregorian version of which is currently in common use. This information can only be filled in after we have synchronized the Jojakin calendar with the Roman calendar. The 8th column (Prophet2) is reserved for the prophets that replace the names written in the 7th column. The 9th column then shows the real succession of human generations at 20years per succession. ​Column1 is then reserved for the Zodiac calendar, and column2 for the Æon calendar (the time of 8.4million years) reflecting the succession of the Aions or heavenly generations. The main calendar of the Aion, namely the Ahaz calendar (The Sundial of Ahaz) is reflected in Column 3. These three calendars are the time-keeping mechanisms of Science, with the Zodiac Calendar an immaculate factual timepiece which science can visually verify. The first 15600years on the Ahaz calendar is the hidden period which the Bible describes as the “darkness over the surface of the deep.” (Gen.1:1, 2) However, the Jojakin Calendar just reflects the “light” period, which runs from Adam till Return of Jesus. The table must be read from the top-down (from 1st Adam to Birth of Jesus), then continuing from Jesus’ DRA (Death, Resurrection, Ascension) to His 2nd coming (the 4th Coming). The table is drawn up in such a manner that the different Generations of the timeline can be distinguished. There are two types of generations. The first is the generation steps which is 20 years, when humans progress from being born to becoming adults, with all the responsibilities that accompany adulthood. So, the whole period of 7200 years of the Adam Calendar is divided into 20year generation steps, giving it a total of 360 generations, which is on average the correct amount of generations for this period of procreation. Every year can thus be correctly reflected by using the generation number, like R2015 (E7005) is G350.05 on the Generations calendar. Note: The Generations Calendar starts 10 years after the rebirth of Adam, which makes it immediately synchronized with the Ahaz calendar, unlike the Jojakin Calendar, where the 10year synch is referred to as the “Jojakin exile”. On the other hand, humans are literally the production of a heavenly generation on earth (Gen.2:1), the work of the Spirit (Rûwach) and the Gods (Elohim) in conjunction with Mother Nature. The narrative of Gen.1:3-31 called “the Creation Days” are in fact six different stages of the progression of the heavenly Generation, with the heavenly Sabbath (Gen.2:2-3) concluding this creation of the heavenly generation on earth. The full complement of this 25200 years on the Ahaz calendar are divided into 3 heaven weeks of 8400 years, which in turn are divided into 7days of 1200 years each, with every seventh day a heavenly Sabbath. It is only for practical reasons that the 3rd creation week of Ahaz is also divided in a second way. Here the creation days reflect different stages of the heavenly “embryo”, so these divisions or “days” are spread over different periods of time. The Jojakin Calendar reflects both. Note. The first 10 years of Adam in Eden is an extension of the Jojakin Calendar and will be deducted again in the “Exile” of the calendar. The 10th year in Eden is the zero of Creation Day1/Generation1. Creation Day1/Generation1: From ADAM (ex Eden) to the FLOOD Covenant (J11-J2252, total 2242years): This era is straightforward. Use the years as supplied by Josephus. Creation Day2/Generation2: From FLOOD Covenant to birth of PELEG (J2252-J2661, total 409years): Here we will also use the years as supplied by Josephus. 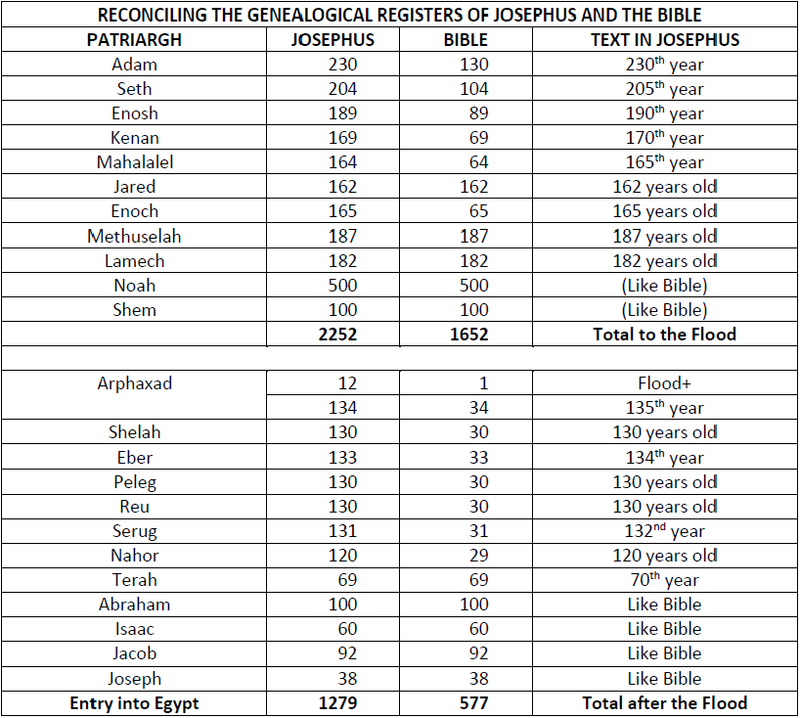 Take note of the discrepancy at Arphaxad where Josephus says he was born 12 years after the flood. This serves as a correcting element in the timeline, as well as denoting the year of birth of a Judge and prophet in Israel. We’ll discuss that when we fill in the seventh column. Creation Day3/Generation3: From PELEG to the EXODUS from Egypt (J2661-J3751, total 1090years): A very important question here would be: how long did Israel sojourn in Egypt, from the Entry of Jacob until the Exodus under Moses. The answer is NOT straightforward. The Bible says 430 years (Ex.12:40), Josephus says 215years (Ant. Bk 2:15:2). Josephus adds a useful piece of evidence with this information. He says that the Exodus started 430 years after Abraham came into Canaan, but 215 years after Jacob went to settle in Egypt. The 430 years of Josephus also corresponds with another text in the Bible: Gal.3:15ff – Here Paul debates about the ‘Law and the Promise’ and says that the Law came 430 years after the Promise was made to Abraham! Exactly agreeing with Josephus. These two verses of ‘witness’ are ample enough to overrule the text in Ex.12:40 and declare it a mistake, and one that made many an attempted chronology take a nosedive into obscurity. The only thing I do not agree with Josephus is the fact that he says the Israelites stayed 215 years in Egypt. One can clearly see that he simply worked from the age given for Abraham when he left Haran. However, there is some information accompanying Gen.12:40, from which it can be exactly derived how long the sojourn was: (v41) “to the very day”. This means that because the Exodus started on the 15th day of Nisan, and that day was on a Friday, the day Jacob was officially declared an ad hoc citizen of Egypt was the day he blessed the Pharaoh (Gen.47:10) and that day was also on a Friday on the 15th day of Nisan. Here the computer had to help. In 215 years one will not get that result, but in 220 years it works out 100%. This means that from Abraham’s Promise (Gen.12) to Jacob’s Entry took 210 years and from Entry to Exodus took 220 years, totalling 430 years. There is also another way of getting to the 210 years. Abraham was 75years old when he received the call to leave ‘his father’s household’ and settle in Canaan (Gen.12:1) I suppose that’s here where Josephus’ computation went wrong. I allow 5 years for this rich man with many belongings and livestock to travel this distance. This means that Abraham was 80 years old when he received the Promise. 20 years later Isaac was born, another 60 years later Jacob was born. When Jacob was 130 he blessed the Pharaoh, giving the total of 210 years (20+60+130=210). For this period also use the years of Josephus. Creation Day4/Generation4: From the EXODUS to the birth of JESUS (J3751-J4992, total 1241years): From the information in the Bible regarding this period it is hard to compile an exact chronology, because timelines are given starting with the different kings or judges or events. To group them together and compile a correct unit is quite impossible. But God has supplied the information in the Bible to address this need. To assemble a correct chronology for this era, we again work with the chronology of Josephus. This time we equate the Flood Covenant with the Exodus. Then we fill in the names starting with Arphaxad ’12 years after the Exodus’. However, this time we add a “2” after each name, to indicate a different person. 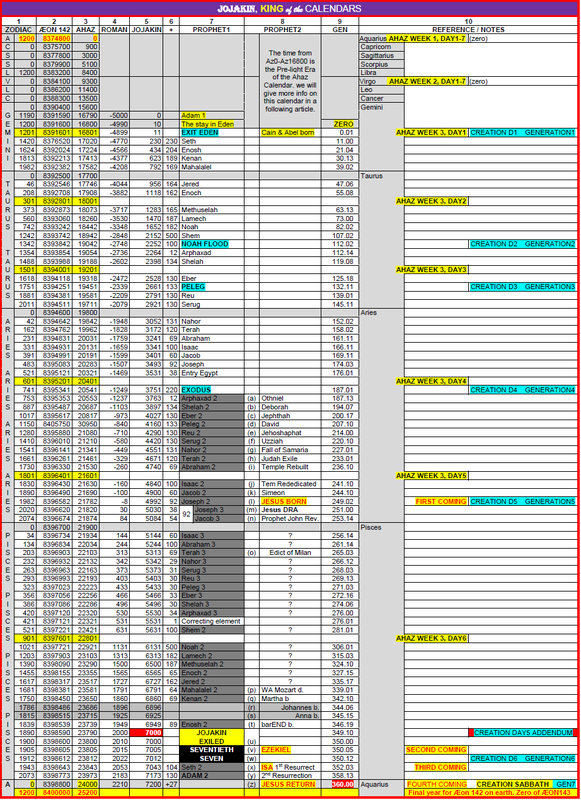 In the 5th column we keep on accumulating the figures to arrive at the total for the Jojakin Calendar, we still leave the fourth column (Roman calendar) blank, but we can start to fill in the real names that belong in the seventh column. The Bible gives cryptic clues as to which names rightfully belong in this column after the Exodus. We give their names in Column 8.
a) Arphaxad2: “Two years (Josephus = 12) after the Flood...Shem... became the father of Arphaxad” (Gen.11:10) Of Othniel it is written: “…give me also springs of water. Then Caleb gave her the upper and lower springs.” (Jud.1:15) This cryptic clue connects the ‘springs of water’ in the dessert with the Flood of Noah and thus Othniel with Arpaxad2. This means that Othniel was born 12 years after the Exodus started. “The spirit of the Lord came upon him…” (Jud.3:10) is the Divine seal that declares him a prophet, born in J3763. b) Shelah2: This name is derived from the Hebrew root meaning ‘to send away’ (H7971) This ‘send away’ command Deborah, a prophetess (Jud.4:4), gives to Barak, but she receives the ‘honour’ of Sisera’s death and at the same time the honour to be the person whose name is written in this column, born in the year J3897. c) Eber2: This name is derived from a primitive Hebrew root meaning ‘cross over’ or ‘beyond’ referring to the Jordan, more specifically the east side. Gilead was on the ‘east-side’ of the Jordan and Jephthah was a Gileadite (Jud.10:8, 11:1) “then the spirit of the Lord came upon Jephthah.” (Jud.11:29) seals him as prophet. Jephthah is then Eber2, born in the year J4027. d) Peleg2: “And two sons were born to Eber. The name of the one was Peleg, for in his days the earth was divided.” (Gen.10:25) We read something of this division about David who became king of a divided society (2sam.5:5), first in Hebron then over all Israel and Judah. 1Sam.16:13 endorse David at his anointing as King the prophet whose name gets written in the column against Peleg2, born in J4160. However, the clue of Peleg (1) also give the approximate date for the Tower of Babel (Gen.11), “for in his days the earth was divided.” This division is also the indicator of the beginning of the third Creation Day aka the Third Generation. e) Reu2: The name means “friend” (H7466) in the sense of H7453 meaning “associate”. This is exactly what Jehoshaphat did: “And Jehoshaphat made peace with the kings of Israel.” (1Ki.22:44). The words “and the Lord was with Jehoshaphat” (2Chr.17:3) endorse him as prophet/king. He is Reu2 and born in J4390. f) Serug2: This word comes from a Hebrew root (H8276) meaning to “entwine”. The name Azariah comes from the Hebrew root ‘aw-zar’ (H5826) which means to ‘surround’ (protect or aid) while the name Uzziah comes from the root ‘aw-zaz’ meaning ‘strength’ These two words became ‘entwined’ in the Jewish vocabulary like even the names ‘Azariah’ and ‘Uzziah’ became synonymous, both referring to the same king. Thus, king Uzziah (Azariah) is the name written in the fifth column against the name Serug2, born in the year J4420. g) Nahor2: This name doesn’t refer to a person, but to a catastrophic event that took place in the history of the Northern Kingdom (Israel). The name comes from a root that means to ‘snort’ or ‘snore’ (H5170). “The snorting of his horses was heard from Dan” (Jer.8:16) is a prophecy alluding to the Fall of Samaria, and non-return exile of Israel in the year A4541. However, the date we have here is J4551, denoting rounding off the process and the starting of the new Samarian Culture in Israel. h) Terah2: This name alludes to another tragic event, but this time it is the turn of Judah and Jerusalem. In Jos.24:2 Joshua said to the people: “This is what JHWH God of Israel says: Long ago your forefathers, including Terah… worshipped other gods.” Then he warns them that if they turn away from the God of Israel and worship those foreign gods, calamity will befall them, and he foretold them the Exile! (v20). History tells us this is exactly what happened. The name Terah thus refers to the Exile of Judah with the burning of the Temple and that happened in the year J4671. This also came to pass for Judah when they were brought back from the Exile to the Promised Land and the covenant was reaffirmed and dedication of the rebuilt Temple (Ez.6:13ff). This is the event Abram2 alludes to, thus the Rebuilt Temple must be written in column 5, as that it happened in the year J4740. j) Isaac2: Abraham was not only the father of all religions (“all the peoples on earth would be blessed through him” – Gen.12:3), but his three ‘heirs’ were also the personification of the three ‘houses’ of God, and these three “Houses” are represented by the ‘Religions of the Book’: Judaism, Christianity and Islam. 1: Eliezer: This was the servant-son Abraham thought would be his heir because of the fact that he could not procreate with his wife Sarah (Gen.15:2). His name means ‘God help’ and he typifies the mobile Tabernacle which was the personification of the Presence and helping hand of God through the Exodus and initial settling in the Promised Land. This Tabernacle is represented by the Religion of Judaism. 2: Ishmael: This first son of Abraham and Hagar is the personification of the Temple in Jerusalem, built on a firm immovable foundation. (cf the theological argument of Paul regarding Hagar and Sarah who confirms this as well as the next point). The Temple in Jerusalem is therefore represented by the Religion of Islam. 3: Isaac: Isaac was the “son of the everlasting covenant” (Gen.17:19) “son of the Promise” (Gal.4:28) The Temple he personifies goes beyond being an earthly Temple. Of the temporal Temple Jesus said: “Destroy this temple and in three days I will raise it up.” (Joh.2:19) He was referring to his Body, and through His Body to the heavenly Temple (Gal.4:26), the “House with the many rooms” (Joh.14:2) where there is room for every religion of the world, through the Blessing of Abraham. The ‘Heavenly Tabernacle’ is then represented by the Religion of Christianity. Now Isaac2 aptly alludes to the Rededication of the Temple, after it was desecrated by Antiochus. On its part is the desecration and following rededication again an allusion to the desecration and following rededication of the Body of Jesus, which are His Death and Resurrection. In the fifth column against Isaac2 this Rededication of the Temple must be filled in with the year it happened as J4840. k) Jacob2: This alludes to a person again. The words of Jacob after seeing his son Joseph (Gen.46:30) again echoed into the Temple after the circumcision and name-giving ceremony of Jesus and he was taken there again for the purification ceremony: (Luk.2:28-29) “Lord, now you will let your servant depart in peace, according to your word, for my eyes have seen Your Salvation”. ​This is then the cryptic clue that Simeon, a prophet (v27) is indeed Jacob2. Josephus also refers to the same prophet, but calls him “Simon, a man of the sect of the Essenes” (Ant.Bk17:13.3). Simeon, born in the year J4900, was indeed an old man of 92 when he spoke those eternal words. ​Joseph saved Egypt and Pharaoh’s world by providing bread during the famine. Jesus Himself became the Bread for the world when He gave His life on the cross. The Christians, representing the whole world, “eat” this Bread in a symbolic way in the Eucharist. JESUS is thus the name that is to be filled in against Joseph2 and he was born in the year J4992. For now, we’ll have to shunt the rest of the Generations on to a side-track, to do this very important exercise, because the world works currently on the adapted Roman calendar. However, I will not explain these two calendars very extensively here, because this will be done on the subpages where ALL the calendars are to be discussed in depth. We are going to synch these two calendars at the year of the Death and Resurrection of Jesus, not only because Biblically speaking we know historically the most about this event, but this is also the Most Important event in the history of the Aion (world). Regarding the year we can narrow the search down to the years when Pontius Pilate was the Governor of Judea, which was the years of R26-R36AZ (After the Zero) (26-36AD) - When we describe the Roman calendar we will find out that BC and AD is the wrong way of expressing these years because Jesus certainly wasn’t born in the year zero. BCE is just as wrong, because the Christian Era only started at Pentecost of the year 30AZ! Similarly important, we’ll need some information about the Passover, because He was crucified on the Day of Preparation for the Passover (not the weekly day of preparation as some theologians have it, although, by a twist of the time, this weekly day of preparation advanced to the Thursday, because the special Sabbath of Nisan 15 fell on the Friday!) and this information will help us pinpoint the year. Now the day of the slaying of the Pascal lamb happened on Nisan 14, which was a Thursday at the time of the Exit, with them leaving early the Friday morning. One can verify that information by following the trek up to the day of Shavuot, when the Law was proclaimed at the Mountain. The Jews currently compute the day of Shavuot as the 50th day after the special Sabbath of the 15th of Nisan, and that day can fall on any day of the week. ​However, the command in Lev.23:15 can (and must!) also be interpreted as the ‘day after the (regular) Sabbath’ which is the 1st day of the week, or Sunday as we have it and giving us a 1st and 2nd Shavuot. The very first Shavuot when the Law was given fell on this 1st day of the week. The Special Sabbath: “The next day, the one after Preparation Day, the chief priests and the Pharisees went to Pilate.” (Mat.27:62) Which day of the week was this ‘next day’? There is just no way that these very distinguished Jewish leaders would have gone anywhere near the palace of the uncircumcised Pilate on the weekly Sabbath, which was the most sombre and holy day on the Jewish calendar. Only the day of Yom Kippur could come anywhere close to it. No, this surely implies that there must have been another day between the crucifixion and the weekly Sabbath. Indeed, the Sabbath was made for man to rest from his daily toil, but the Sabbath was principally instituted for the Lord of the Sabbath to rest from His Toil (giving His Life) on two consecutive Sabbath Days which being Nisan 15, followed by the regular weekly Sabbath. This strengthens the claim that the crucifixion happened on a THURSDAY. “He was raised on the third day, according to the Scriptures.” (1Cor.15:4): The “third day” means that He was raised after two days. This even gives us an idea precisely when Jesus rose from the grave. The Jewish day begins like any other Lunar-day at sunset and ends the following day at sunset. The Bible says, “evening approached” (Mat.27:57) when they took Jesus from the cross and placed him in a nearby tomb. This means that in fulfilling the Scriptures, Jesus was placed in the tomb at sunset on the 5th day of the week (Thursday) and He came out of that tomb at sunset on the 7th day of the week (Saturday) which is officially the start of the 1st day of the week. With this information the Scriptures confirms that the crucifixion of Jesus happened on a THURSDAY. And Good Friday? : The Christians currently commemorate the Day of Crucifixion on a Friday, because this is the regular weekly day of Preparation for the Sabbath and they call this special day Good Friday. As it is confirmed now that Jesus was killed on a Thursday, precisely what then is the significance of Good Friday? For this answer we will have to turn the clock right back to the day of the Exodus. Like Jesus, the Paschal lamb was killed on a Thursday. The Passover Meal was eaten after sunset. At midnight the angel of death struck the Egyptian firstborn down and early on Friday morning the Exodus started when the congregation left Egypt. And this is the reason why this Friday became Good Friday. The Jews commemorated the physical Exodus from Egypt by the blood of a lamb from their flock, while the Christians celebrate the spiritual Exodus from sin (Egypt) through the Blood of Jesus, Lamb of God and Saviour of the world. Now that we know for sure that the killing of Jesus (and the Paschal lamb in Egypt) took place on a Thursday, it is a very simple exercise to pin the year of the crucifixion down. As already mentioned, it had to be within the timeframe of the governorship of Pilate (R26-R36). Now the first month on the Lunisolar calendar is the new moon of the lunation with the first full moon phase that occurs after the March equinox. The first day of any Lunisolar month starts at sunset following the Solar-day (midnight to midnight) of the new moon. For the 15th day of the first Luni-solar month to fall on a Friday (starting Thursday evening) the new moon must be on a Wednesday. This means that during the years of Pilate’s governorship, there are only two days that qualify: R27 and R30. And the choice between the two isn’t hard to make. In the year R27 the equinox and new moon differ by more than three days, while in the year R30 both fall on the same day. This means that we can synchronize the Jojakin (Lunisolar) calendar and the Roman (Solar) calendar in the years J5030 and R30. This brings a very startling fact to the fore: From the first Adam’s Awakening (Gen.2) to the last Adam’s (1Cor.15:45) Rebirth (Resurrection) there are exactly 5000 years! There is also a very sad aspect about the year of the synchronizing: At Shavuot the Jews leave the Moses Exodus calendar they were marching on from the start of the Exodus and they moved over to the Azazel Exodus calendar, which would take them to the utmost misery and eventual death as the historical Jews at the hands of the Avenger. From the first Pentecost to TThT: Looking at the Chronological Table, a few other peculiarities come to the fore. The year of the birth of Jesus acts like a mirror. From this point on the years of succession of the prophets as given in the Bible are used, instead of those given by Josephus. It is also not the years of birth that are indicated, but the years of the earthly death of the chronological prophets which is simultaneously the time of their heavenly births. It is only for the names Kenan2 and Enosh2 where we revert to their births. I will do a few of the names in the fifth column. The ones with the question marks I will leave open for a historian who wants to tackle this job. The first name that will come up in the mirror image is that of Joseph3, 38 years after the birth of Joseph2. As we have already discussed, the 2nd Joseph was Jesus born in the flesh. The 3rd Joseph is now the risen Jesus, or the Jesus born in the spirit. As we have already noted, in this section the succession is mirror-like, which means from ‘son’ to ‘father’ and the year of birth means the heavenly birth. m) Joseph3 → n) Jacob3: Now the 92 years between Joseph and Jacob is divided 38-54. This means that Joseph3 indicate the heavenly rebirth of Jesus (Resurrection) and a further 54 years after Joseph3 it is time for Jacob3 to conclude his life on earth and be born into the heavenly Priesthood. But now for exactly ‘who’ is this Jacob3. This one needs a separate full-length article, which cannot be done here. Suffice to say he is the first High Priest (Pontiff or Pope) of the Christian Church and he took office from Jesus who reigned 40 years from the first Pentecost until the destruction of the Jewish Temple in R70. He’s the Prophet John who was on the isle of Patmos on the ‘Day of the Lord’ (Rev.1:9ff) when he received the “Revelation”. He died later that same year in R84. The dream of Jacob at Bethel (Gen.28:10ff) is the type of the vision of John. In conclusion I will just add here that he is NOT the Apostle John, but indeed a very intriguing character. The rest of the names up to the ‘Exodus’ I will leave blank for a historian to fill in, except for a few. From the DRA of Jesus the names between Joseph and the Exodus are repeated in reverse order, but this time the years in the Bible are used. Then the names between the Entry into Egypt and the Flood are completely ignored, except for the 1-year correcting element that is added on. o) Lamech2: This one is a bit harder to get. This is not a person, but a proclamation of which the declaration of Lamech in Gen.4:23 is a type. The proclamation here is the Edict of Milan that was promulgated in R313. p) Mahalalel2: An easy one to get. Mahalalel means “Praise of God” or “Hallelujah” and what other composer was there who died in R1791 that could beat the likes of WA Mozart? q) Kenan2: Kenan means “fixed” (fromH7064) “erect” (H7077) and “nest” (H7064). This means that the ‘mirror’ prophets or events stop being random here. The prophetical line of succession becomes “fixed” and newly “erected” in a bloodline again for the last two prophets, like the prophets from Adam through to Jesus. The second-to-last human prophet starts the “nest” with her birth and her bloodline is carried through to her great-grandson who would be the last prophet of flesh and blood for this Aion. She is Martha Sofia Korf. Her year of birth is R1860. r) Enosh2: Enosh means “mortal” (H582). This just refers to the fact that this will be the very last ‘mortal’ prophet. No human can reveal this person as so countless many have vainly tried to do. He cannot even reveal himself. Only God can and will do that and in God’s own Time. He is a man of many hats, a millennial figure expected in the eschatological literature of many different religions. The year of his birth is R1949 and his name is barEND, which means “son of the End”. That means that the link between Kenan2 and Enosh2 is a family bloodline. In fact, Kenan2 is the great-grandmother of Enosh2. In the diagram I have filled in this name as Martha, followed by her son Johannes (r) the grandfather of Enosh2, followed by the mother, Anna (s) of Enosh2, then the Man himself, barEND (t). ​ This is also an example of how the genealogical succession in the registers are abbreviated and there can be many generations between “father” or “mother” and “son”. During this Aion there were two synchronizations. The first was a synchronization of Kairos-time, where the Earth-clock was set to have the time of the First Exodus and the time of the Second Exodus 100% (up to the second) in synch 1279 years later. This exercise was necessary because of the prophetic calendar associated with these two eras. However, we will explain this phenomenon in depth when we discuss this calendar. What is important for this article here is the synchronization of the Jojakin calendar. We are not there yet, but I will just mention that Adam was awakened in the year 16790 on the Sundial of Ahaz (16790SA). You will just have to be patient until we discuss all these calendars, but I just give this information for the sake of a little background to the synchronization of the Adam calendar and I’ve filled it in in the diagram. Now ALL the calendars of the Aion, religious as well as secular, are hitched to and synched with this Master-calendar, which runs through a period of 25200years, namely the Ahaz calendar. Adam was awakened 10 years ‘before’ his time which would have been in synch if it was the year A16800. This was done to allow for the 10 years stay of him and Eve in the Garden of Eden. However, there was a time predetermined for this correction of the Adam calendar and that moment is called “Time, Times and half a Time” (TThT). There is a prophetic calendar flowing from this concept, but we’ll just stick to determining the moment for that synchronization here. Now when we look at the calendar on the last page, we’ll see that there is a total of 7000 years set aside from the awakening of Adam to the end of the fifth Generation. Now to understand the concept of TThT properly the 7000 years must be divided into two parts of ‘Time’ and ‘Times’ of which ‘Time’ must be half of ‘Times’. If you take the 7000th year out of the equation as being the Great Jubilee, the sum is easy to do. That would leave us with 6999years. Now divide this in three equal amounts of 2333years. This would mean that “Times” would take us from A0 to A4666 and from there “Time” would take us further to A6999 with A7000 the Great Jubilee. Now this Jubilee is only called ‘Great’ because it is extended over a period of 10 years, starting on April 5 R2000 at sunset until sunset on March 16 R2010 Jerusalem Time. If one look at this against what is written in 2Ki.20 and Isa.38, the Sundial of Ahaz is marked in 25200 ‘degrees’ or ‘steps’ of years. All the other calendars are also marked in steps indicating their years and beginnings and endings are linked to the ‘steps’ of the Sundial of Ahaz, like the Sundial of Ahaz is a big geared disc, with the other calendars all smaller gears running on the big disc. Now Adam was awakened when the sun has gone down 16790 steps on Ahaz, thus when the Sundial of Ahaz came to 23790 the steps on the Jojakin dial already approached 7000 years. Now the ‘shadow’ had to go backward to 6990 years on the Jojakin Dial to compensate for this and bring the clocks into sync. It is as simple as that. ​Nobody must do anything because nobody is yet using the Jojakin calendar. The Jews will only start to use this calendar from the 1st of the 1st lunisolar month of the year R2023 after the Moolah calendar they are currently on concludes on 27th September, R2022 at sunset. Now I do believe that historically there was this sundial built by king Ahaz and that King Hezekiah had a supernatural healing from his sickness, but the shadow only went back for him in a vision similarly like, so many people had visions before and after him. The addendum starts “from the time that the daily sacrifice is abolished” (Dan.12:11), meaning that time is “abolished” in the process of syncing the calendars. That abolishing starts at sunset on the 5th of April 2000, at the end of the lunisolar year. The Jojakin Calendar proceeds again at the end of the synch at sunset on March 16, 2010. Jesus here confirms that this Generation was active in His time, and will carry on until the Great Tribulation, when the “Blessed One” (Ezekiel) will be revealed on the world stage. There is a special timeline and calendar for this period which we will cover in another article. w) The Seventieth Seven: We are going to discuss the “seventy sevens” (Dan.9:24) in a separate article, but when Ezekiel arrives on April 5, 2015, “the fifth year (after) of the exile of King Jojakin”, the final or 70th seven kicked in and will run through until 27th September, R2022, before the 6th Generation will start on the 28th of September 2022. The Great Tribulation: This is the final plague distributed from heaven that will rock mankind’s very foundations. It will happen during the 70th seven, after the revelation of Ezekiel as Elijah. We will discuss this event more elaborately in a later article. x) Seth2: During the reign of Ezekiel there are two great events on the cards. The first is the Coming of Messiah, which is scheduled 104 years after the birth of Enosh2 (barEND). About this figure we also cannot elaborate here, because we will have to dig deeper than the awakening of Adam for this pre-Adam “dark era” calendar period to be revealed. What can be said here is the fact that he is a different Person from and Counterpart of Jesus. He is, like Seth of Adam and Eve, in the place of “the righteous Abel” (Matt.23:35). He is the last prophet in a prophetic line of the “dark” (hidden) period (see diagram) that started with the birth of Adam (note that Adam was only revived again at the start of the “light” period on Az16790) and ends with the death of Isa followed by the Great Global Flood of 40years. This “hidden” prophetic line culminates in Mohammad, the prophet of Islam, who is the seal of those prophets, joining the “dark” period of Isa with the “light” period of Jesus. He is the One the Jews are waiting for. He is the ISA Islam also calls Jesus. Apostle Paul refers to him as “another Jesus”. (2Cor.11:4). The main object of the Coming of Ezekiel is to prepare the way for these two cataclysmic Comings during his reign. This will only happen after the second resurrection, when those present at the crucifixion and all those back to the very beginning will be present to witness His Coming. No one will know the hour of His coming, that’s why there are 27years allowed for this great event in which His Coming will be imminent at any moment. z) Jesus and Isa start to rule on Earth: This is the beginning of the end of the ultimate era on earth for the humans of Aion142. The Adam, Roman and all the other religious calendars mouthed into and ended in the final and Great Jubilee of Az24000. On the Sundial of Ahaz, the sun moved down on to the step of 24000 years (Az24000), and on the Science calendar it will be Era Pisces2100, which is at the same time the zero of Era Aquarius. ​Then, from Az24001 Christ (Jesus) and His Counterpart, Messiah (Isa), will reign on earth for 1200 years over the resurrected Kingdom heirs until the Sundial of Ahaz will register its full complement of 25200 years (Era Aquarius 1200). Then the humans of the current Aion142 will wrap up their stay on earth and move into the Heavenly Tabernacle, the true “Zion, the heavenly Jerusalem, the city of the living God” (Heb.12:22). In the next article we will first have to show how science must verify the time, by producing the Zodiac Calendar. Then we will set up a calendar that will show the pre-light Era of the Ahaz Calendar.